This annual is the Latin American "bean herb," so called because it is almost invariably added to cooking beans. Whether that is for its flavor or for its rumored minimizing of what Julia Child called "the rooty-toot-toot" problem with eating beans is uncertain. The spice expert Gernot Katzer writes of epazote: "Epazote’s fragrance is strong, but difficult to describe. People would often compare it with (in no particular order) citrus, petroleum, savory, mint or putty. I think it smells like epazote." Other sources describe its flavor with "The bruised leaves emit an unpleasant foetid odour." Don’t be put off the herb by such descriptions: many flavorings that are overtly repellent are excellent additions to cooking in small or dilute quantities (consider cilantro, or asafoetida). There is also some room for suspicion that this is another of those aromas that different people sense very differently, probably depending on their genes. We find it has a sort of pine/resin quality; you may think something else altogether. Mexican cooking expert Diana Kennedy says that to cook black beans without epazote is "unthinkable", adding that when a recipe calls for epazote, there is no substitute. For more discussion of the herb and its uses, see the links listed below. We have not found any evidence of named types. Epazote is not fussy about soil, but wants full sun and good drainage. 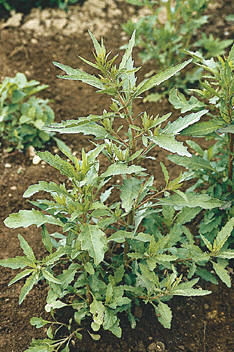 As with most herbs, a less-than-rich soil produces the best and most concentrated flavor in the leaves. It can grow fairly large, up to 2 to 3 feet tall, so give it a good-size pot. Sow a few seeds in the pot, and after emergence thin to the best plant. Germination rates are usually very good, and seedlings should appear within a few days of sowing the seed. If you elect to grow it outdoors, beware: it self-seeds readily and is considered highly invasive. Epazote is usually described as an annual, but apparently can be perennial given warm winter temperatures (as we would have indoors)—so take care of your plant and it might last you some years. Watering information is scanty, suggesting that the plant needs neither unusually high nor unusually low amounts, though it is not considered drought-hardy. When harvesting, cut the center stem first, to encourage bushing. Prune the plant frequently to prevent flowering and assure a continuing supply of leaf, but don’t harvest more than half the plant at a time. And, as with most herbs, we don’t want to fertilize it, lest we weaken the flavor. When adding epazote to a cooked dish, toss it in shortly before cooking completes, say 15 minutes before. Epazote - a use-oriented article, this from "Kate’s Global Kitchen"
You loaded this page on Friday, 19 April 2019, at 16:30 EDT. It was last modified on Monday, 4 February 2019, at 03:05 EST.